Migrants warm up by fire while waiting to enter a camp in Spielfeld, Austria, Sunday, Oct. 25, 2015. Thousands of mostly Middle Eastern migrants fleeing war and poverty continued pushing Monday through the Balkans toward Western Europe, as European Union leaders struggled to avert a looming humanitarian disaster with winter fast approaching. As cold weather continues to set in on much of the continent, EU leaders met Sunday for a fifth time to address the crisis. The grouping agreed to expand reception centers in Greece to accommodate 100,000 more migrants, while failing to bridge political differences dividing the continent between those governments willing to help address the crisis and those so far refusing to provide long-term shelter. Hours later, German Chancellor Angela Merkel, whose government has welcomed waves of foreigners, described the crisis as "one of the greatest litmus tests Europe has ever faced." EU chief Jean-Claude Juncker said more reception centers will be constructed along the so-called Balkan route traveled by most migrants from war-torn Syria in recent weeks. The new structures will house 50,000 people, while additional facilities are planned in Greece for 50,000 more migrants. 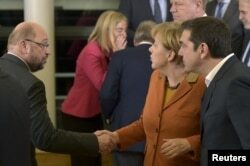 From left, European Parliament President Martin Schulz, Germany's Chancellor Angela Merkel and Greece's Prime Minister Alexis Tsipras chat after a meeting about the Balkan refugee crisis with leaders from central and eastern Europe, Oct. 25, 2015. Juncker, who released nearly 20 aid proposals Monday, described the reception units as vital for registering migrants and managing their travels. But he also voiced dismay that previous vows of help from EU countries have not yet been acted upon. The mini gathering of central and eastern European leaders Sunday was sought by Chancellor Merkel, who has voiced concern for migrants as winter sets in. The meeting was the latest in a series of top-level EU meetings to find a unified approach on how to best deal with the thousands of migrants streaming into the EU every day. On Sunday, Croatia Interior Ministry spokesman Domagoj Dzigulovic said a record 11,500 migrants entered the country Saturday — the most in a single day since the flow of migrants began in mid-September. Police said the country has seen nearly 250,000 enter the country since then. The leaders of Austria, Bulgaria, Croatia, Macedonia, Germany, Greece, Hungary, Romania, Serbia and Slovenia, attended the Brussels summit. But some EU lawmakers complained ahead of the meeting that all 28 EU member countries should attend and that France's absence in particular threatened progress on a plan. A man comforts a woman upon arrival with other refugees and migrants on the Greek island of Lesbos on October 25, 2015 after they crossed the Aegean sea from Turkey. 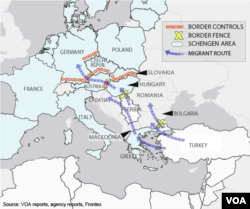 Bulgaria, Serbia and Romania said they would close their borders if Germany or other countries shut the door on refugees. A group of migrants walks toward Austria from a camp in Sentilj, Slovenia, Oct. 25, 2015. Serbian Prime Minister Aleksandar Vucic said Sunday Serbia would not "put up any walls" but suggested his country will not agree to be the only migrant stop if countries farther west close their borders. The lack of a common policy is straining ties among European leaders, raising questions about the EU's future. Rights group Amnesty International said the 28-counry bloc could not afford to end another meeting without an agreed plan. At least three migrants — two children and a woman — drowned on Sunday when their boat sank off the Greek island of Lesbos, the coast guard said, the latest fatalities in Europe's refugee crisis which has claimed nearly 3,000 lives. Also Sunday, the bodies of 40 people thought to be migrants were discovered on beaches near a city 160 kilometers (100 miles) east of Tripoli, the Red Crescent said.